Wizarding World fans Steph Bennett, 26, and Emily Scouler, 25, from Buxton in Derbyshire, share a magical moment under the Fantastic Beasts: Wizarding World Wands. Steph chose the London installation which consists of nine giant wands from the Harry Potter and Fantastic Beasts films as a fitting venue to propose to Emily, shortly before a military marching band, the Grenadier Guards, performed music from the Harry Potter and Fantastic Beasts films at the Fantastic Beasts: Wizarding World Wands supporting Lumos installation on Peters Hill (London). Hundreds of Wizarding World fans gathered to watch the performance between the regular evening light displays. This was the final of a series of three Wizarding Wednesday events, in celebration of Fantastic Beasts: The Crimes of Grindelwald. This weekend will be the last chance to catch the light-up wand installation, which has been live for the last three weeks as part of the City of London Arts Initiative for public art, illuminating each evening from 6.45pm. 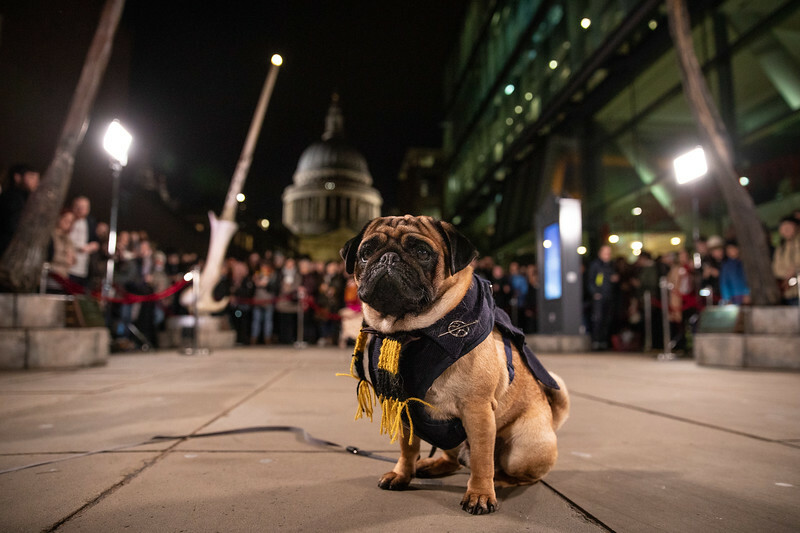 FREE FOR EDITORIAL USE - A military marching band, the Grenadier Guards, performed music from the Harry Potter and Fantastic Beasts films at the Fantastic Beasts: Wizarding World Wands supporting Lumos installation on Peters Hill (London). Hundreds of Wizarding World fans gathered to watch the performance between the regular evening light displays. This was the final of a series of three Wizarding Wednesday events, in celebration of Fantastic Beasts: The Crimes of Grindelwald. This weekend will be the last chance to catch the light-up wand installation, which has been live for the last three weeks as part of the City of London Arts Initiative for public art, illuminating each evening from 6.45pm.